the 6% outweighs the 1500 anyway, I'd be happy to get it I just didn't know what to expect if I got the membership after. You never know if you don't ask i guess. Thanks for the advice. Theres no reason the dealership should give you any gruff if you redo the deal to incorporate the ACNA discount at the time of pickup. Just give them a heads up beforehand so they have time to prepare the paperwork properly. Hyper: I live in FL and I am currently negotiating with a dealer in SC. They have offered I believe around 4.5% off the MSRP. Assuming we agree on pricing I plan on pulling the trigger in the next 1-2 weeks. He is telling me he has an S6 in the order bank that is amendable (as of now) and set to build the week of April 7th. If I purchase the lifetime ACNA membership prior to an agreeing on price would the 6% discount apply immediately or is there a waiting period? Is there something ACNA would send me that I would have to send the dealer proving I am a lifetime member? You first need to confirm your dealer will honor supplier pricing (ACNA discount is supplier pricing 6% off MSRP). If so, you will need to pay $750 for a lifetime membership (covers two people) and you will need to contact Sally at ACNA who will email you a signed supplier discount form to turn in at time of delivery. Last edited by Dr Chill; 03-09-2014 at 11:03 AM. 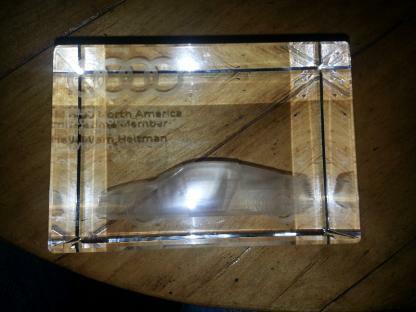 You'll also get this cool lucite block with an R8 etching inside in the mail a few weeks later. You should be able to get this deal much closer to home. No need to go out of local area for ANCA discount. I'd recommend ordering a new 2015 which should be orderable in April. My 2014 was ordered in April and arrived July 11th. Last edited by Dr Chill; 03-09-2014 at 04:40 PM. I didn't get one of those. You should be able to get this deal much closer to home. No need to go out of local area for ANCA discount. I'd recommend ordering a new 2015 which should be orerable in April. My 2014 was ordered in April and arrived July 11th. Thanks for the information. I was on the fence about waiting on the 2015 and got impatient. Any idea about the changes for 2015 and is a July 2014 delivery possible for a 2015 S6 ordered next month? No idea of what changes there will be yet. Delivery date will depend on when on when production starts. If you place your order the first day the Order Guide is up and running, you will get one of the first 15's. Cool. I guess one more month will not make too much of a difference. I am intrigued by the lifetime ACNA membership to get a 6% discount. I am looking at an on-the-lot S6. Is the ACNA discount solely off of MSRP or could I negotiate my best deal and then expect to apply the 6% discount to the negotiated price?